We’ve gotten used to seeing titles with Bad BLANK as a quick way of letting audiences know what they should be expecting from certain types of movies: edgy comedy, even if the premise seems cute. There have been a few that worked, but if those makers are concerned with criticism, producers might want to think twice about using Bad in the titles of their movies. It’s just too easy not to think up punny headlines. But Bad Mom’s clearly not concerned about criticism considering the product they’ve put out; and some movies just aim to please an audience. But I doubt the makers were that concerned with their audiences, or actually providing a female alternative to the “men behaving badly” comedies which are so common (and which writer-directors Jon Lucas and Scott Moore were responsible for with The Hangover, 21 & Over, and The Change–Up). 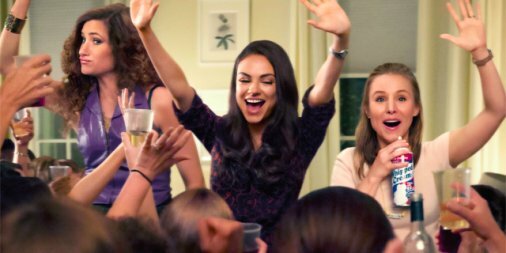 While I’m grateful that Hollywood has realized that female audiences are among comedy fans and are under-served, that doesn’t mean they should be forced to settle for garbage…which is what we get from Bad Moms. The movie stars Mila Kunis as Amy, a 30 something with a trendy job, really nice house, two overachieving kids…who just can’t seem to get her life together and be the perfect mom. Amy is a character who on paper should be frazzled by life’s demands of kids, a job, a mortgage and everything else she’s juggling (I only have one of those things and I’m a mess most of the time). But the life she’s leading on screen and the things she’s complaining about don’t line up in this movie. She tells someone she needs her job because they need the money and that’s why she’s not involved ENOUGH in school activities, but she’s only paid as a part time employee and stays out of loyalty. She says she’s exhausted and stressed all the time yet nothing in the performance, script, or direction sells that premise which is supposed to be key to what audiences identify with initially so they can get into the outlandish comedy. After one of the worst attempts to parody the rise up scene in Network, Amy finds two fellow mom friends to bond with; there’s the stay at home mom Kiki whose husband thinks he got married in the 50s to a more subservient version of Donna Reed played by Kristen Bell and hard partying single mother Carla played by Kathryn Hahn. And they decide to rebel and stop worrying about being good moms. It’s weird that their rebellion’s aimed at motherhood when the big problem they seem to have is with the PTA Board run by Gwendolyn James, played by Christina Applegate. If the PTA’s so terrible, just don’t go (I know so many parents who don’t bother with PTA or parent-teacher events). Or, make the plot be about trying to overthrow the PTA…which is what this movie ultimately turns into. First we get their “rebellion” and as per usual, we get the classic slow-motion acts of ridiculous behavior which was cliché 20 years ago. Dear Hollywood, slowing something down won’t make something unfunny automatically funny. I completely believe that outrageous or bad behavior can be comedi, although poor parenting happens to have a larger bar to clear because of the concerns about child endangerment (Neighbors), but it is possible. The movie could have embraced the unbelievably vulgar and doing extreme forms of rebellion (like the women in the series and new movie Absolutely Fabulous) or doing the reverse and having real sentiment regarding specific, modern day stresses of motherhood (Tallulah). But instead the movie’s as tame and uninspired as a 90s sitcom. While trying to balance raunchy humor and unearned sentimentality without any authentic characters, the movie proves to be bland and uninteresting, when not simply unpleasant. The one aspect that’s downright intolerable is David Walton’s character Mike, Amy’s loser husband (soon to be ex-husband). The movie’s script is so underdeveloped, the writers tend to take shortcuts to pander to their “target audience” of women looking for a girl power comedy comparable to the outrageous male comedies we see. An example of that would be Amy and Mike’s marriage. They couldn’t have just outgrown each other (considering they were married at 20, that’s not unheard of) or be stressed out by the pressures of parenting. He can’t even just be an oblivious father who doesn’t notice the extra work his wife takes on. He’s literally a moron with a narcissistic personality that the therapist they go to (in the worst scene in the movie) should probably be concerned about. The scenes are not funny but obnoxious, and it seems to be presented this way simply to make sure Amy comes across as blameless in the disillusionment of her marriage.It’s a problem we see again and again with movies with women at the center of the action that are clearly not written either from a female perspective or by men who understand (or take a sincere interest in) women. To make a movie which appeals and identifies with female audiences, the women don’t need to be perfect or faultless (they shouldn’t be); they need to be identifiable. Kunis is a fine actress and comedienne but without a script, she doesn’t manage to elevate the film and the character weighs her down because she’s the only actress asked to play the “realistic” mom. The difference in her work here and her costar Christina Applegate stronger work in last year’s Vacation movie (also a terrible movie) had me questioning why this couldn’t have been a vehicle for Applegate to lead up. That decision would have also avoided the age issue they feel compelled to address here, which still feels a bit forced as a way of avoiding complaints about the film being ageist towards women. Bell does better thanks to her natural sense of comic timing and animated reactions playing a cartoonish character. The character’s weak but she adds some spark of her own. Hahn does the best work in the film with the broadest character, but even she can’t make Carla into a real character. At best she dives into the comedy head first, and when all else fails, she just gets louder to make audiences think there’s a joke. Jada Pinkett Smith and Annie Mumolo are completely wasted as Applegate’s Greek chorus (Smith might have 20 lines total). Overall however all these women have been better in other movies and deserve a better script than they got to play with. Hey, you know who could have given them one, Annie Mumolo, the co-writer of Bridesmaids. This movie isn’t terrible because it’s written by two men. It’s bad because it’s so completely obvious that it’s written by two men who don’t seem to understand the women they’re writing about (and for). When the movie ends, the stars mothers are shown talking about their times being bad moms and making mistakes. It’s definitely the funniest section of the movie, but also almost sad to see how big an opportunity the film wasted. Had the writing-directing team of Jon Lucas and Scott Moore done these interviews beforehand (and really listened and understood what these women were saying) the movie had the potential for being about something real, rooting even absurd comedy in something recognizable. The jokes are lame, the talent wasted, the directing uninspired, the sentimentality and basic logic out of alignment and the overall theme bordering on offensive. 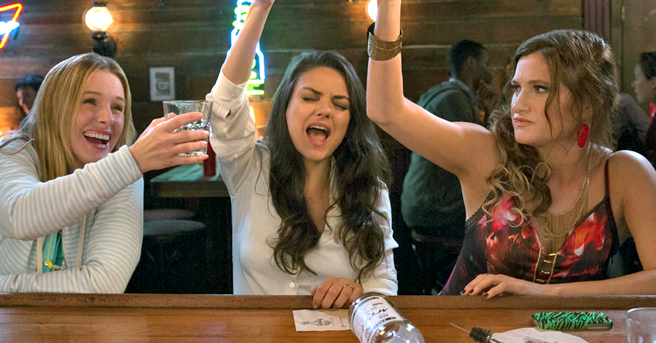 The condescending approach of a movie like Bad Moms left me squirming in my seat.